Turn down the lights and put on some neon! Take your group’s dodgeball game to the next level. 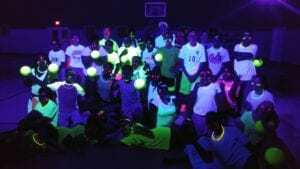 Play glow-in-the-dark dodgeball at Black Rock Retreat’s gym in Lancaster County, PA, or we can come to your gym. Type of Dodgeball: Play your favorite variation of dodgeball or we can teach you some of ours! Discount – Overnight guests pay only $100 per hour when booking more than 30 days in advance!